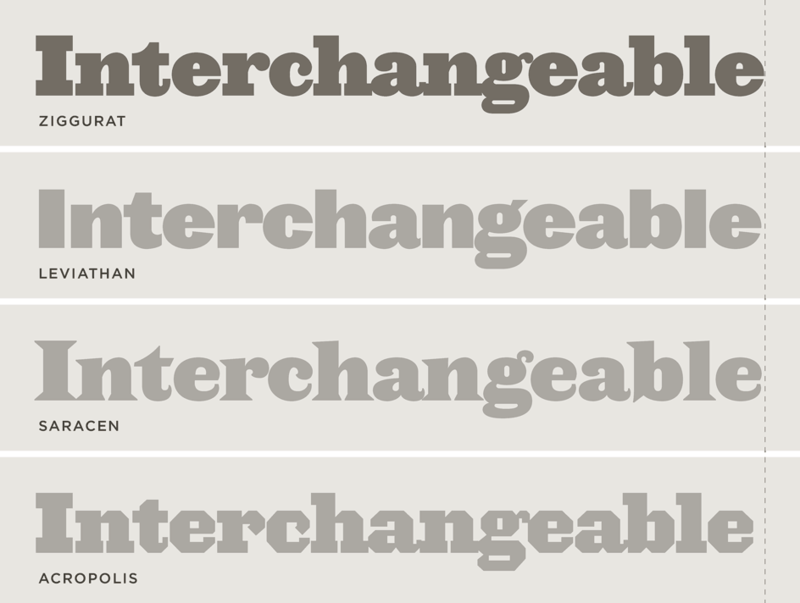 Ziggurat Font Features: Transposability | Hoefler & Co.
A modular set of font families. Ziggurat was designed to be interchangeable with the three other families in The Proteus Project. These fonts were designed in response to an age-old question: how can a fixed format be changed without resorting to a full redesign? The fonts in The Proteus Project were designed around a common set of proportions, allowing them to be substituted for one another almost invisibly. This offers editorial designers the ability to periodically refresh their formats, without having to anticipate any changes in copyfitting. For packaging designers, these related fonts offer a natural way for line extensions to refer back to the original product, without directly imitating its design. Transposability. Ziggurat is part of The Proteus Project, a collection of typefaces built on related character widths, which allows all four families to be interchanged almost invisibly. Language Support. Ziggurat features our Latin-X™ character set, covering more than 140 languages throughout the world — including all of Central Europe.